Back in December 2015 the first sod was cut at Rogers Avenue, Creswell which signified the start of the first phase of our B@Home partnership. Seven properties on the former garage site on Rodgers Avenue in Creswell are now complete as part our partnership with Woodhead Living and EEM, which will see an anticipated 150 new council homes in the next four years. The new properties, which are all modern and energy efficient, are already being enjoyed by their new occupants. 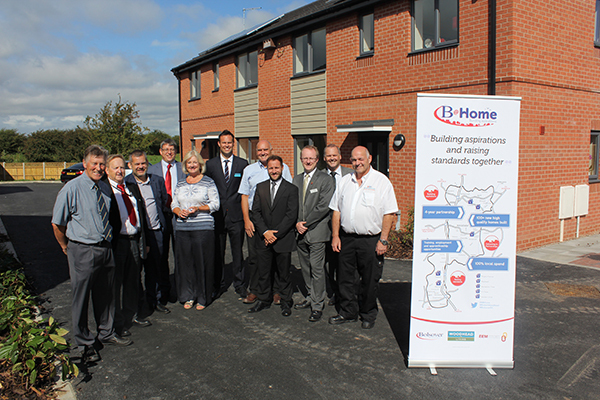 Leader, Councillor Ann Syrett said, “We are truly delighted with the first set of completed homes in our B@Home project. It takes us a step closer towards our goal of meeting housing demand. Cabinet Member for Housing, Councillor John Ritchie said, “Our aim is to provide homes that are both affordable and desirable and we believe we have achieved this with our first set of B@Home properties.